เนื่องจากการมีอยู่ของ Pu-240 ในการเกิดพลูโทเนียมในเครื่องปฏิกรณ์นิวเคลียร์ การออกแบบการระเบิดจากภายในจึงถูกพัฒนาขึ้นมาสำหรับ "แฟตแมน" และ อาวุธที่ใช้ในการทดสอบ "ทรินนิที"
ในกรณีนี้ถือว่าเป็นการทำลายจริยธรรมและคำปฏิญาณทางการแพทย์อย่างร้ายแรง มีข้อคิดเห็นมากมายที่แสดงความคิดเห็นว่าแม้การกระทำนั้นจะถือว่าเป็นการทำลายต่อความเชื่อถือและจริยธรรม "ผลของพลูโทเนียมที่ฉีดเข้าไปในร่างกายผู้ป่วยไม่ได้ทำให้เกิดความเสียหายหรือเจ็บป่วยอย่างที่ถูกเสริมแต่งกันในข่าวตอนแรก จึงไม่มีนักวิทยาศาสตร์ใส่ใจและเชื่อเรื่องนี้มากนักทั้งใน ณ ขณะนั้นและในปัจจุบันนี้"
Crooks, William J. (2002). "Nuclear Criticality Safety Engineering Training Module 10 – Criticality Safety in Material Processing Operations, Part 1" (PDF). สืบค้นเมื่อ 2006-02-15. ↑ ตามบทความที่มี อ้างถึงข้อมูลที่ซีบอร์กกล่าว: "จริงๆแล้วสัญลักษณ์ควรจะเป็น Pl แต่ตลกดีเมื่อซีบอร์กเสนอให้เป็น Pu ซึ่งเหมือนคำที่เด็กร้องอุทาน 'Pee-yoo! (พี-ยู) ' เมื่อได้กลิ่นบางอย่างที่แย่ๆ ซีบอร์กคิดว่าเขาจะได้รับการวิจารณ์ที่เผ็ดร้อนในการเสนอสัญลักษณ์นี้ แต่คณะกรรมการการตั้งชื่อได้ยอมรับโดยปราศจากข้อโต้แย้ง"
Hammel, E.F. (2000). "The taming of "49" – Big Science in little time. 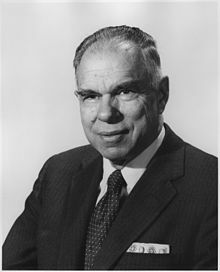 Recollections of Edward F. Hammel, pp. 2-9. In: Cooper N.G. Ed. (2000). Challenges in Plutonium Science" (PDF). Los Alamos Science. 26 (1): 2–9. สืบค้นเมื่อ 2009-02-15. Hecker, S.S. (2000). 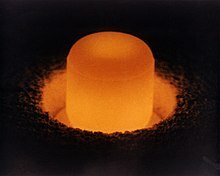 "Plutonium: an historical overview. In: Challenges in Plutonium Science". Los Alamos Science. 26 (1): 1–2. สืบค้นเมื่อ 2009-02-15. Wahlen, R.K. (1989). History of 100-B Area (PDF). Richland, Washington: Westinghouse Hanford Company. p. 1. WHC-EP-0273. สืบค้นเมื่อ 2009-02-15. "Weekly List Actions". National Park Service. 2008-08-29. สืบค้นเมื่อ 2008-08-30. "Proliferation of Nuclear Weapons and Materials to State and Non-State Actors: What It Means for the Future of Nuclear Power" (PDF). University of Michigan Symposium. Federation of American Scientists. 2002-10-04. สืบค้นเมื่อ 2009-01-04. ↑ ARQ staff (2008). "Nitric acid processing". Actinide Research Quarterly. Los Alamos (NM): Los Alamos National Laboratory (3rd quarter). สืบค้นเมื่อ 2009-02-15. While plutonium dioxide is normally olive green, samples can be various colors. It is generally believed that the color is a function of chemical purity, stoichiometry, particle size, and method of preparation, although the color resulting from a given preparation method is not always reproducible. ↑ 5.0 5.1 5.2 5.3 5.4 5.5 5.6 5.7 NNDC contributors (2008). Alejandro A. Sonzogni (Database Manager), ed. "Chart of Nuclides". Upton (NY): National Nuclear Data Center, Brookhaven National Laboratory. สืบค้นเมื่อ 2008-09-13. ↑ Rhodes, Richard (1986). The Making of the Atomic Bomb. New York: Simon & Schuster. pp. 659–660. ISBN 0-671-65719-4. Leona Marshall: "When you hold a lump of it in your hand, it feels warm, like a live rabbit"
↑ 9.0 9.1 9.2 Hecker, Siegfried S. (2000). "Plutonium and its alloys: from atoms to microstructure" (PDF). Los Alamos Science. 26: 290–335. สืบค้นเมื่อ 2009-02-15. ↑ 12.0 12.1 12.2 12.3 12.4 12.5 12.6 12.7 CRC contributors (2006). David R. Lide, ed. Handbook of Chemistry and Physics (87th ed.). Boca Raton (FL): CRC Press, Taylor & Francis Group. ISBN 0849304873. ↑ EPA contributors (2008). "Fissile Material". Radiation Glossary. United States Environmental Protection Agency. สืบค้นเมื่อ 2008-11-23. ↑ Asimov, Isaac (1988). "Nuclear Reactors". Understanding Physics. Barnes & Noble Publishing. p. 905. ISBN 0880292512. ↑ Gosling, F.G. (1999). The Manhattan Project: Making the Atomic Bomb (PDF). Oak Ridge (TN): United States Department of Energy. p. 40. DOE/MA-0001-01/99. สืบค้นเมื่อ 2009-02-15. ↑ Matlack, George (2002). A Plutonium Primer: An Introduction to Plutonium Chemistry and its Radioactivity. Los Alamos National Laboratory. LA-UR-02-6594. ↑ Eagleson, Mary (1994). Concise Encyclopedia Chemistry. Walter de Gruyter. p. 840. ISBN 9783110114515. ↑ DOE contributors (2004). "Oklo: Natural Nuclear Reactors". U.S. Department of Energy, Office of Civilian Radioactive Waste Management. DOE/YMP-0010. สืบค้นเมื่อ 2008-11-16. ↑ Holden, Norman E. (2001). "A Short History of Nuclear Data and Its Evaluation". 51st Meeting of the USDOE Cross Section Evaluation Working Group. Upton (NY): National Nuclear Data Center, Brookhaven National Laboratory. สืบค้นเมื่อ 2009-01-03. ↑ Fermi, Enrico (December 12, 1938). "Artifical radioactivity produced by neutron bombardment: Noble Lecture" (PDF). Royal Swedish Academy of Sciences. ↑ LBNL contributors. "Elements 93 and 94". Advanced Computing for Science Department, Lawrence Berkeley National Laboratory. สืบค้นเมื่อ 2008-09-17. ↑ PBS contributors (1997). "Frontline interview with Seaborg". Frontline. Public Broadcasting Service. สืบค้นเมื่อ 2008-12-07. ↑ NPS contributors. "Room 405, George Herbert Jones Laboratory". National Park Service. สืบค้นเมื่อ 2008-12-14. ↑ LANL contributors. "Site Selection". LANL History. Los Alamos, New Mexico: Los Alamos National Laboratory. สืบค้นเมื่อ 2008-12-23. ↑ 41.0 41.1 Sublette, Carey. 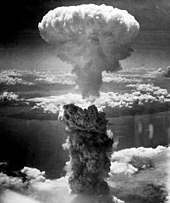 "Atomic History Timeline 1942-1944". Washington (DC): Atomic Heritage Foundation. สืบค้นเมื่อ 2008-12-22. ↑ 42.0 42.1 Wahlen, R.K. (1989). History of 100-B Area (PDF). Richland, Washington: Westinghouse Hanford Company. pp. iv, 1. WHC-EP-0273. สืบค้นเมื่อ 2009-02-15. ↑ Rincon, Paul (2009). "BBC NEWS – Science & Environment – US nuclear relic found in bottle". สืบค้นเมื่อ 2009-03-02. ↑ Gebel, Erika (2009). "Old plutonium, new tricks". Analytical Chemistry. 81 (5): 1724. doi:10.1021/ac900093b. ↑ Sublette, Carey (2007-07-03). "8.1.1 The Design of Gadget, Fat Man, and "Joe 1" (RDS-1)". Nuclear Weapons Frequently Asked Questions (2.18 ed.). The Nuclear Weapon Archive. สืบค้นเมื่อ 2008-01-04. ↑ 47.0 47.1 Malik, John (September 1985). The Yields of the Hiroshima and Nagasaki Explosions (PDF). Los Alamos. p. Table VI. LA-8819. สืบค้นเมื่อ 2009-02-15. ↑ DOE contributors (2001). 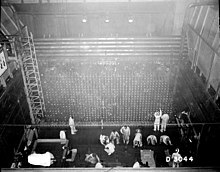 Historic American Engineering Record: B Reactor (105-B Building). Richland (WA): U.S. Department of Energy. p. 110. DOE/RL-2001-16. สืบค้นเมื่อ 2008-12-24. ↑ Cochran, Thomas B. (1997). Safeguarding nuclear weapons-usable materials in Russia (PDF). International Forum on Illegal Nuclear Traffic. Washington (DC): Natural Resources Defense Council, Inc. สืบค้นเมื่อ 2008-12-21. ↑ Press Secretary (July 23, 2002). "President Signs Yucca Mountain Bill". Washington (DC): Office of the Press Secretary, White House. Archived from the original on 2008-03-06. สืบค้นเมื่อ 2009-01-04. ↑ 52.0 52.1 Voelz, George L. (2000). "Plutonium and Health: How great is the risk?". Los Alamos Science. Los Alamos (NM): Los Alamos National Laboratory (26): 78–79. ↑ Yesley, Michael S. (1995). "'Ethical Harm' and the Plutonium Injection Experiments" (PDF). Los Alamos Science. 23: 280–283. สืบค้นเมื่อ 2009-02-15. ↑ Martin, James E. (2000). Physics for Radiation Protection (1st ed.). Wiley-Interscience. p. 532. ISBN 0471353736. ↑ 55.0 55.1 FAS contributors (1998). "Nuclear Weapon Design". Federation of American Scientists. สืบค้นเมื่อ 2008-12-07. ↑ WNA contributors (2006). "Mixed Oxide Fuel (MOX)". London (UK): World Nuclear Association. สืบค้นเมื่อ 2008-12-14. ↑ Besmann, Theodore M. (2005). "Thermochemical Behavior of Gallium in Weapons-Material-Derived Mixed-Oxide Light Water Reactor (LWR) Fuel". Journal of the American Ceramic Society. 81 (12): 3071–3076. doi:10.1111/j.1151-2916.1998.tb02740.x. ↑ "BGU combats nuclear proliferation". สืบค้นเมื่อ 2009-03-05. ↑ 60.0 60.1 ARQ contributors (2005). "From heat sources to heart sources: Los Alamos made material for plutonium-powered pumper". Actinide Research Quarterly. Los Alamos (NM): Los Alamos National Laboratory (1). สืบค้นเมื่อ 2009-02-15. ↑ ORAU contributors (1974). "Plutonium Powered Pacemaker". Oak Ridge (TN): Orau.org. สืบค้นเมื่อ 2008-09-12. ↑ ATSDR contributors (2007). "Toxicological Profile for Plutonium, Draft for Public Comment". U.S. Department of Health and Human Services, Agency for Toxic Substances and Disease Registry (ATSDR). สืบค้นเมื่อ 2008-05-22. ↑ 67.0 67.1 WNA contributors (2008). "Plutonium". London (UK): World Nuclear Association. สืบค้นเมื่อ 2008-05-22. ↑ ANL staff (2001). "ANL human health fact sheet--plutonium" (PDF). Argonne National Laboratory. สืบค้นเมื่อ 2007-06-16. ↑ DOE staff. "Radiological control technical training" (PDF). U.S. Department of Energy. DOE-HDBK-1122-99. Archived from the original (PDF) on 2007-06-30. สืบค้นเมื่อ 2008-12-14. ↑ Welsome, Eileen (2000). The Plutonium Files: America's Secret Medical Experiments in the Cold War. New York (NY): Random House. p. 17. ISBN 0-385-31954-1. ↑ Roark, Kevin N. (2000). Criticality accidents report issued. Los Alamos (NM): Los Alamos National Laboratory. สืบค้นเมื่อ 2008-11-16. ↑ LANL contributors. "Raemer Schreiber". Staff Biographies. Los Alamos (NM): Los Alamos National Laboratory. สืบค้นเมื่อ 2008-11-16. ↑ 76.0 76.1 76.2 76.3 DOE contributors. "Plutonium". Nuclear Safety and the Environment. Department of Energy, Office of Health Safety and Security. สืบค้นเมื่อ 2008-12-07. ↑ DOE contributors (1994). "Primer on Spontaneous Heating and Pyrophoricity – Pyrophoric Metals – Plutonium". Washington (DC): U.S. Department of Energy, Office of Nuclear Safety, Quality Assurance and Environment. DOE-HDBK-1081-94. Archived from the original on 2007-04-28. CRC contributors (2006). David R. Lide, ed. Handbook of Chemistry and Physics (87th ed.). Boca Raton (FL): CRC Press, Taylor & Francis Group. ISBN 0849304873. Emsley, John (2001). "Plutonium". Nature's Building Blocks: An A-Z Guide to the Elements. Oxford (UK): Oxford University Press. pp. 324–329. ISBN 0198503407. Heiserman, David L. (1992). "Element 94: Plutonium". Exploring Chemical Elements and their Compounds. New York (NY): TAB Books. pp. 337–340. ISBN 0-8306-3018-X. Stwertka, Albert (1998). "Plutonium". Guide to the Elements (Revised ed.). Oxford (UK): Oxford University Press. ISBN 0-19-508083-1. IEER contributors (2005). "Physical, Nuclear, and Chemical, Properties of Plutonium". IEER. สืบค้นเมื่อ 2009-02-15. Ong, C. (1999). "World Plutonium Inventories". Nuclear Files.org. สืบค้นเมื่อ 2009-02-15. LANL contributors (2000). 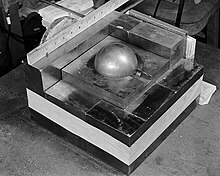 "Challenges in Plutonium Science". Los Alamos Science. I & II (26). สืบค้นเมื่อ 2009-02-15. NLM contributors. "Plutonium, Radioactive". NLM Hazardous Substances Databank. สืบค้นเมื่อ 2009-02-15. Alsos contributors. "Annotated Bibliography on plutonium". Alsos Digital Library for Nuclear Issues. สืบค้นเมื่อ 2009-02-15. หน้านี้แก้ไขล่าสุดเมื่อวันที่ 28 ธันวาคม 2561 เวลา 19:01 น.